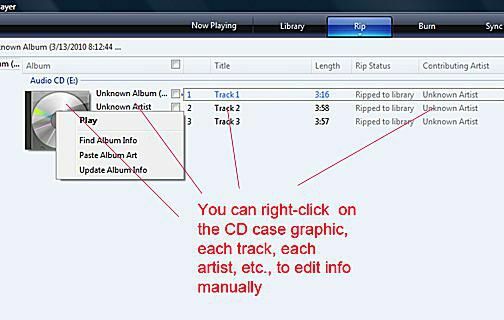 Ever wondered how to rip or copy music from a CD? This tutorial will show you how, using a program available to anybody with a PC for free — Windows Media Player. When I first put together this tutorial on how to use Windows Media Player to rip music or tunes from a CD, I used Windows Media Player 11 for testing as well as my screenshots. Since then, Windows Media Player 12 has come out. Then there are some of you who might still be using WMP 10. Even if you don't have Windows Media Player 11, however, recent versions of WMP (i.e. the aforementioned Windows Media Player 10 and Windows Media Player 12) basically use the same steps, so ripping with other WMP versions will not be a problem. The latest WMP 12, for example, has some differences with its Library and preview functions but is still quite similar to WMP 11. You can do a quick rip if the "AutoPlay" menu comes out when you insert a disk in your computer's DVD/CD drive. 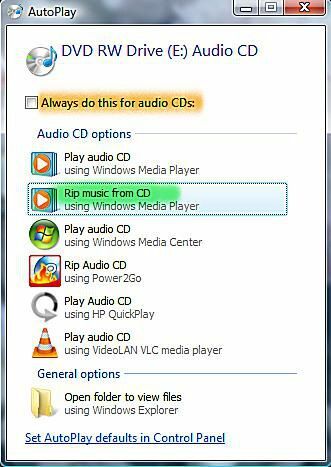 One of the options under AutoPlay is to "Rip Music From CD (using Windows Media Player)" which will automatically launch Windows Media Player and the Rip menu. 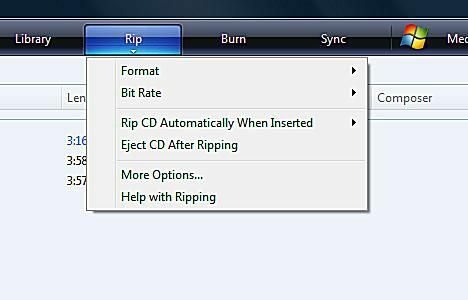 Make sure you uncheck the "Always do this for Audio CDs" box so your computer doesn't automatically launch the Rip menu every time you insert a CD (i.e. in case you just want to listen to a CD next time). Start the ripping process by clicking on the "Start Rip" button (e.g. in Windows Media Player 11, for example, it's on the lower right once you're in the Rip menu). You'll also have an option to use your Internet connection and have Windows Media Player automatically find details about the CD you're using so you don't have to fill out album and song details yourself (for this tutorial, let's assume that you're not connected to the Internet, which means you'll end up with an unknown album with unknown songs). You'll know the ripping process is done once all the songs show "Ripped to library" under "Rip status." By default, Windows Media Player will rip your tunes in WMA format and save it in your "Music" folder. You can access the folder by clicking on the Windows logo at the bottom left of your computer's screen. For Windows XP, for example, it'll be the "Start" button. For Windows Vista or Windows 7, it's the circular icon with the Windows four-panel graphic that looks like a waving flag. Clicking the "Start" button in Windows XP will bring up a menu box with "My Music" as one of the options. For Vista, clicking on the Windows button will bring up a menu with "Music" as one of your options. Anyway, clicking on either of those choices will open your music folder. Look under Unknown Artist and you should be able to find the Unknown Album you just ripped. Once you find the songs, you can rename them one by one. To do a normal rip, let's go to the next step. 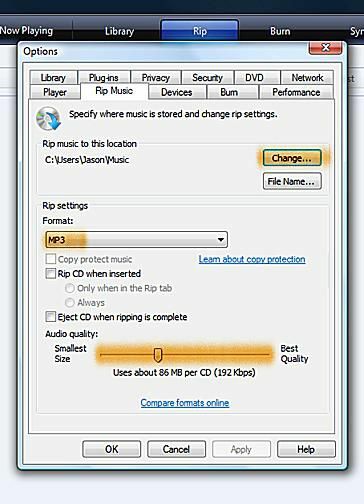 For more options, like changing your ripped music's format to MP3 or changing the folder where you save your music, you can do a normal rip. Once you're in the Rip menu, click on the Rip tab to bring up a list of options. "Format" lets you pick between Windows Media Audio formats, WAV, and the more popular MP3 format. The WMA and WAV both have "lossless" format options, which means the music will be ripped with no loss in quality. The MP3 format, meanwhile, offers wider compatibility with portable music players and smaller file sizes but sacrifices a certain amount of quality depending on the bit rate of your file. This brings us to the "Bit Rate" button, which basically lets you pick the quality of the rip. The default for bit rate is 128 Kbps. Note that the higher the bit rate you pick, the better the quality you'll get, but you'll also get a larger file size. For more ripping options, let's go to Step 3. Clicking "More Options" brings up, even more, choices. Under "Rip Options" you can change the destination folder for your ripped music by clicking the "Change" button under "Rip music to this location." If you haven't done so, you can also change your format (e.g. to MP3) and bit rate in this menu as well (with the latter using a slider). Once you're satisfied with your settings, click "OK." For album and track options, go to Step 4. If you want to let Windows Media Player automatically find album info online, you can manually do so at this point by right clicking on the CD icon and bring up a submenu that includes "Find Album Info" as an option. If you see your album, highlight it and hit "Next." This will bring up a verification screen and you can click "Finish." Besides updating your Rip info, this will also update your Windows Media Player library with the new album and track details. 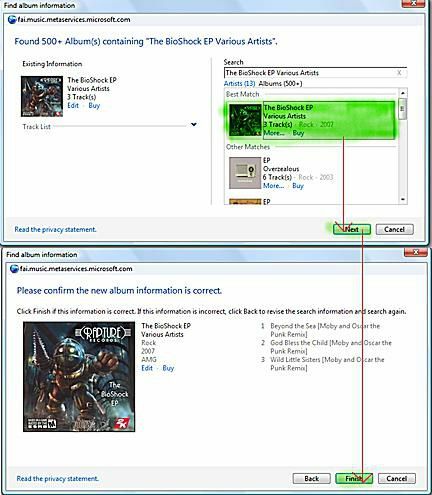 If you don't have an Internet connection or if Windows Media Player can't find your album, you can update the album and music info manually in Windows Media Player by right clicking on each individual piece of info you want to edit (e.g. Unknown Album, Unknown Artist, Track 1, etc.). Before you start ripping, note the check marks next to each song. This indicates which songs will be ripped. Feel free to uncheck any songs you don't particularly care for and don't want to be ripped. Once you're all set, you can then click on the "Start Rip" button. Time to go to Step 5. Once you're done ripping, you'll see the message "Ripped to library" next to each song. From here, you can start using Windows Media Player to move your songs to a compatible portable music player or burn the tunes to a CD. If you somehow skipped the option to let Windows Media Player automatically find album info online, you can still do so after ripping by right-clicking on the CD icon and bringing up a submenu that includes "Find Album Info" as an option. You can also still update the album and track info manually in Windows Media Player by right clicking on each individual piece of info you want to edit (e.g. Unknown Album, Unknown Artist, Track 1, etc.). Otherwise, you can also go into your music folder or wherever you saved your tunes and edit each file manually. Depending on your portable music or media player, you can also drag tunes from your destination folder and into your player to copy them over. Well, that's it. Now you know how to rip CDs with Windows Media Player. As always, please feel free to e-mail your guide for other tutorial suggestions related to portable electronics. Happy ripping.